There are 1 cat videos tagged with gorilla. Koko got her birthday wish this July 4th — not only did one kitten come to visit, but a whole litter. Koko fell in love with one, and the other fell in love with her. Koko has adopted these two kittens into her family, and it has energized her world. Not only have Koko's maternal and play instincts kicked in, but she is signing more to her caregivers and generating new content everyday that can be used by The Gorilla Foundation to create empathy fro great apes. This can have significant benefits to both endangered free-living great apes and those in captive environments, by encouraging the development of 2-way communication with their caregivers (which Koko has had since she was a baby). 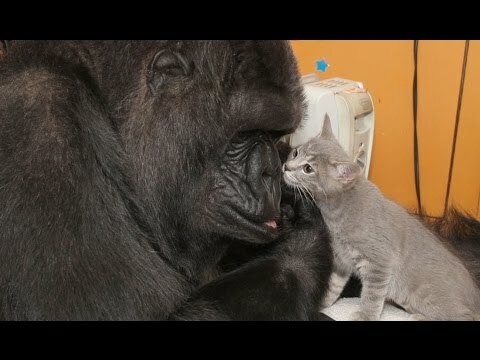 The Gorilla Foundation is now working on a multimedia sequel to the classic book, "Koko's Kitten," which has already reached millions of children worldwide, and has the power to motivate millions more to learn how to make the world a better place for all of its conscious inhabitants. You can support The Gorilla Foundation mission of Conservation through Communication by visiting http://www.koko.org — thank you!